Bag check for racers: Welcome of participants, reception and distribution of racers bag. 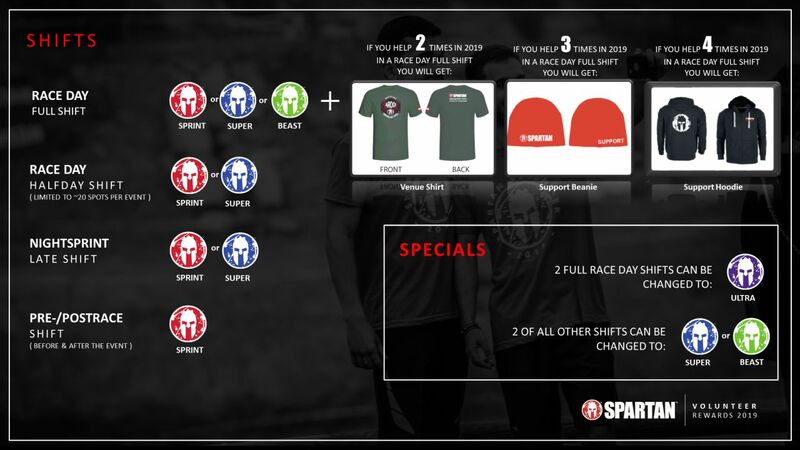 A free entry* for a Spartan Race depending of your volunteering day. Pre and Post race (full shift) volunteering day: Sprint code. Race day (full shift) volunteering day: Sprint or Super or Stadion code. Race day (half day shift) volunteering day: Sprint code. Note: we are introducing the half day volunteering for 2019 events. It’s limited to 20 spots and the missions will be around the festival (registration, bag check or finish line). For organizational reasons, you will not be able to volunteer on the obstacles/aid stations for the half day. * The codes are available during 1 year in the list of the following countries: Spain, Italy, Germany, Austria, France and Netherlands. Note: the more you volunteer, the more Spartan products you can earn! Volunteer on two race days and grab your free venue shirt. Support us three times on a race day and you will get your crew hat. Volunteer on four race days and we will say thank you with our special hoodie – not available for purchase! STEP 2: Pay close attention to your email, especially as the race gets closer. Your Volunteer Coordinator will send you all final details, parking passes, etc. via email. I have a question that wasn’t answered in the FAQ, how do I contact the specific Volunteer Coordinator for my race? All Volunteer Coordinators can be reached at netherlands@spartanraceeurope.com. Just make sure to include the race location you are interested in when you email. Do not forget to join our Volunteer Facebook Group! NOTICE: There are only limited registrations available on NON-race days.